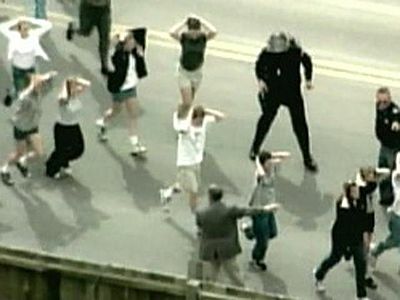 2002 analysis of the phenomenon of school shootings, which the author claims reflect the totalitarian mass psychology of capitalism in crisis, whose perpetrators are described as "robots of capitalist competition gone haywire" in a "culture of self-destruction and self-forgetting". For some years now an expression has become common in the western world: “school massacre”. The schools, which were in days gone by places for a more or less authoritarian education, pubescent eroticism and harmless juvenile mischief, are getting more public attention as the scenes of bloody tragedies. Of course, accounts of crazed murderers are also known from the past. But the current bloody excesses have a new quality all their own. They cannot be allowed to be hidden in a cloud of anthropological generalities. To the contrary, they are specific products of contemporary society. The new quality of these insane acts of murder can be confirmed by several of their aspects. For example, they are not events separated from one another by long intervals, as in prior epochs; the new massacres have been taking place, since the 1990s, in an increasingly more rapid sequence. Two other aspects are also new. A large and disproportionate percentage of the perpetrators are youths, and some are even children. Also, only a very small number of these homicidal maniacs suffer from a mental disorder in the clinical sense; on the contrary, most were considered, prior to their outbursts, “normal” and well-adjusted. When the media confirm this fact, always with apparent surprise, they indirectly and involuntarily admit that the “normality” of present-day society bears within itself the potential for these acts of murderous rage. The global and universal character of such phenomena also demands attention. It began in the U.S. In 1997, in the city of Paducah (Kentucky), a 14-year-old adolescent shot three of his classmates to death after the morning announcements and wounded five others. In 1998, in Jonesboro (Arkansas), an 11-year-old child along with a 13-year-old opened fire in their school, killing four girls and a teacher. That same year, in Springfield (Oregon), a 17-year-old youth shot two classmates to death in his high school and wounded twenty others. One year later, two youths aged 17 and 18 carried out the famous Littleton (Colorado) bloodbath [at Columbine High School—translator’s note]: with firearms and explosives they killed twelve of their schoolmates and one teacher, and then immediately took their leave of this life. In Europe, these school massacres were from the beginning interpreted, still in the context of the traditional anti-Americanism, as a consequence of the gun cult, of social Darwinism and of the insufficient social education of the U.S. But the U.S., in all those respects, is exactly the model for the whole capitalist world of globalization, as would soon be demonstrated. In the small Canadian city of Taber, barely one week after the events at Littleton, a 14-year-old adolescent opened fire randomly, killing a classmate. Other school massacres took place during the 1990s in Scotland, Japan and various African countries. In Germany, in November of 1999, a 15-year-old high school student, brandishing two daggers, killed his teacher; in March of 2000 a 16-year-old young man shot his school principal to death and then tried to commit suicide; in February of 2001, a 22-year-old young man killed his boss with a revolver and then killed the principal of his former high school before finally jumping off a roof and detonating a pipe bomb in mid-air. The most recent act of homicidal rage involving 19-year-old youth in Erfurt who, at the end of April 2002, during the high school final exams, killed 16 people with a bomb (among them almost the entire teaching staff of his school) and then immediately shot himself in the head, was only the culmination of a whole series of such events. Naturally, the phenomenon of the school massacres cannot be considered isolated from its context. The barbarous “culture of the act of homicidal rage” has for some time been a regular media event in many countries; the maddened young school shooters form only one part of this social micro-explosion. Official accounts of acts of homicidal rage on all continents are still scarcely reported; due to their relative frequency, they only gain the attention of the media when they have a suitably spectacular effect. Thus, the well-appointed Swede who, at the end of 2001 riddled a session of parliament with bullets and then killed himself, attained the same global celebrity as that French university student, graduated and unemployed, who opened fire a few months later with two pistols on the Municipal Council of the Parisian suburb of Nanterre, killing eight local police officers. If the acts of psycho killers are more common than school massacres, both phenomena are in turn integrated in the broader context of a culture of violence within society, which is plaguing the whole world in the course of globalization. The virtual and open civil wars, the economy of pillage on all continents, the criminality of armed masses, joined into gangs in the poor neighborhoods, in the ghettoes and the shanty-towns; generally, it is the universal “continuation of competition by other means”. On the one hand, it is a culture of robbery and murder, whose violence is directed at others; in the meantime, the perpetrators themselves run the “risk” of dying. At the same time, however, direct self-aggression is also increasing, as the rising rates of juvenile suicides in many countries demonstrate. For modern history at least, it is a new development that suicide is not only practiced out of individual desperation, but also in an organized form and on a mass scale. In countries and cultures as distant from one another as the U.S., Switzerland, Germany and Uganda, the so-called “suicide cults” attracted attention at various times in the 1990s, in a gruesome manner, by their collective and ritualized acts of suicide. The act of homicidal rage accordingly appears to constitute, in the recent global culture of violence, the logical connection between aggression against others and self-aggression, a sort of synthesis of staged murder and suicide. Most homicidal maniacs not only kill indiscriminately, but also kill themselves immediately thereafter. And the distinct forms of postmodern violence begin to merge. The potential perpetrator of a robbery is also a potential psycho killer. Unlike the acts of the psycho killer in pre-modern societies (the word “amok”* is derived from the Malayan language), it is not a matter of spontaneous outbursts of insane rage, but of actions carefully planned long in advance. The bourgeois subject is still distinguished by strategic “self-control” and by functional discipline even when he sinks into homicidal madness. The psycho killers are robots of capitalist competition gone haywire: subjects of the crisis, dedicated to the concept of the modern subject, and fully educated in all of its characteristics. Even someone who is completely blind in terms of social theory must see the parallels with the terrorists of September 11 and with the suicidal terrorists of the Palestinian intifada. Many western ideologues tried to unconditionally attribute these acts, with obvious apologetic intent, to the “alien cultural domain” of Islam. In the media it is openly said concerning the terrorists of New York, whose plot took shape during uninterrupted years of residence in Germany and the United States, that, despite having conformed externally, they “never came to the west” from the psychic and spiritual point of view. The phenomenon of Islamic terrorism, with its suicide attacks, was due to the historical circumstance that Islam had never had an epoch of Enlightenment. The obvious internal affinity between the young western psycho killers and the young Islamic suicidal terrorists demonstrates exactly the contrary. Both phenomena belong within the context of capitalist globalization; they are the most recent “postmodern” result of the bourgeois Enlightenment itself. Precisely because they “came” to the west in all of its aspects, the young Arab students were transformed into terrorists. In reality, at the beginning of the 21st century the West (read: the immediate character of the world market and of its totalitarian subjectivity centered in competition) found itself in the midst of a great transformation under specific conditions. But the difference of these conditions has more to do with the distinct force of capital than with cultural diversity. Today, capitalist socialization is not secondary on any continent, but primary; and what was hypostatized by postmodern ideologues as “cultural difference”, is instead part of a thin skin. The diary of one of the psycho killers of Littleton was quite understandably secured under seven seals by the North American authorities. Due to a leak from an official, it is known that the young criminal had written the following, among other violent fantasies: “Why not hijack a plane sometime and make it crash into New York?” How embarrassing! What was presented as a particularly perfidious atrocity of an alien culture, had already taken form in the mind of a product coming entirely from the “factory of freedom and democracy”. Some time ago, officials also emphasized the information that, a few weeks after September 11 in the U.S., a 15-year-old adolescent had crashed a small plane into a building. The North American media stated, in all seriousness, that the boy had taken an overdose of acne medication and had therefore suffered from a temporary mental disturbance. This explanation is a worthy product of enlightenment philosophy in its last, positivist stage. In reality, the “thirst for death” represents a postmodern global social phenomenon which is not linked to any particular social place or culture. This impulse cannot be disguised by taking it for the mere sum of isolated and fortuitous phenomena. It evokes what is actually experienced by the millions who circulate with the same intellectual standards and insoluble emotions and play with the same morbid ideas. The Islamic terrorists differ from the individual psycho killers of the west only in appearance, by their demands’ political motives and for being members of an organized religion. Both are equally estranged from a classical “idealism” which could justify its self-sacrifice with real social goals. As for the numerous new civil wars and the vandalism in the downtowns of western cities, the German writer Hans Magnus Enzensberger states that “it is no longer about anything”. But to understand it, one must turn the answer around: “what is this nothing it is about?” It is the total emptiness of money elevated to an end-in-itself, which now definitively rules existence as the secularized god of modernity. This reified god itself possesses no perceptual or social content. Things and their absence are not recognized by their own qualities, but are instead evacuated of their qualities in the name of “economizing”, that is, of transforming them into the mere “gelatin” (Marx) of valorization and thus into indifferent substance (“gleich-gültig”). This culture of self-destruction and self-forgetting, which Hannah Arendt still exclusively applied to the totalitarian political regimes of the epoch, is now returning, in a much purer form, in the economic totalitarianism of globalized capital. What in the past was a state of emergency is becoming the normal and permanent state: everyday “civil” life is becoming the total self-destruction of man. This state is not restricted to the poor and impoverished but applies to everyone, because it is becoming the predominant state of world society. This is especially true for children and adolescents, who no longer have any possible criteria for comparison or critique. It is a loss of self-identity and a loss of the capacity for judgment in view of the overwhelming economic imperative which equally characterizes gangs of thugs, looters and criminals as well as the self-exploiters of the “new economy” and the suit-wearing workers in “investment banking”. What Hannah Arendt says about the presuppositions for political totalitarianism is now the principle task of the school: “To uproot any interest in oneself”, in order to transform the children into abstract machines of production; more precisely, into “their own bosses”, thus without any guarantee. These children understand that they must sacrifice themselves on the altar of valorization and yet also experience “pleasure” in this sacrifice. Elementary school students are already stuffed full of psychopharmaceutical drugs so they can compete in the game of “winners or losers”. The result is a disturbed psyche of pure unsociability, for which self-affirmation and self-destruction are identical. It is the psycho killer who necessarily comes into existence right behind the postmodern “self-manager”. And the democracy of the market economy cries crocodile tears for its lost children, whom it systematically educated to be autistic monsters. Original German title: “Der Todestrieb der Konkurrenz” (www.krisis.org). Taken from the Portuguese-language edition of Krisis. *In German amokläufe, and in Portuguese amoque or amouco, refer to a psychological disturbance characterized by a period of depression followed by violent attempts to kill people. It is derived from the Malayan amok (“madman”). In German, amokläufer designates a person who is the victim of this disturbance. There are no equivalent words in Spanish. In English, of course, we have the phrase, “to run amok” (to engage in a murderous frenzy or rampage).